PanSpy is a professional monitoring solution provider specializing in tracking and monitoring tools for smartphone users. It allows parents monitor text messages, calls, current GPS location, SnapChat, WhatsApp and many more. Along with all of the benefits provided by the development of digital technology, our world is still full of dangers. Moreover, while some of them are obvious, others are hidden in the vastness of the Internet. From cyber bullying to online predators, everyone can become a target, especially when it comes to underage children. This is exactly why we all need a world-class phone tracker, able to secure our kids and businesses! Luckily, with the help of the PanSpy tracking software, to monitor another person’s mobile device or even computer has never been easier! 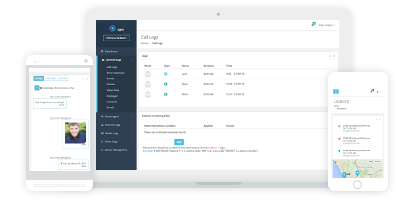 Equipped with numerous useful features, including GPS tracking, text and call logs, website blocking, and keyword alerts, the PanSpy cell phone tracking software is intended to protect both, minor children from online dangers and business owners from corporate information and assets leakage. PanSpy cell phone tracker is a wise solution for any family! Is the PanSpy mobile phone tracker legal? Underage children. As a parent or a legal guardian, you can install the phone tracking software on your kid’s mobile device even without their knowledge as PanSpy works in a complete stealth mode. After all, you pay for that device or network so that you can monitor any activity or communication that takes place on it. Employees. As you know the surveillance in the workplace is absolutely legal, no matter whether it comes to your office, corporate cars, or even company-owned devices. Therefore, the tracking software installed on the computers and phones used by your employees is also legal. Moreover, it’s already a must have, as a powerful cell phone tracker can easily prevent data and assets leakage. Nevertheless, please note that if you want to monitor your employees’ personal devices, they should be informed about it beforehand. In addition, a mobile phone tracker can also be used in case the owner of the target device is aware of your intentions. Thus, many families use cell phone tracking software to protect each other online or to monitor the location of their beloved ones. PanSpy offers both, PC and phone tracking software, for your peace of mind! In this way, while other monitoring apps are limited in their features or support, a multi-functional PanSpy phone tracker is able to provide its users with everything they need. It is actually the most efficient software used for tracking someone’s online activity and location existing today. So if you are looking for a smart solution to the problem of online safety for minors or information leakage for your business, PanSpy is the right choice. After all, our goal is to provide our customers with state-of-the-art monitoring solutions that suit familial and corporate needs and bring the desired result at an affordable price.